We welcome this guest post from Stephen Benedict Dyson. Star Trek Into Darkness, the number one movie in America, is rife with political resonance. Political scientists have taken to analyzing popular cultural entertainment, and Star Trek, in its classic and current incarnations, is perhaps the most fertile ground of all for this. It was always deeply political. The original 1960s television series reflected cold war tensions, featuring border strife between the idealistic good guys and other belligerent, mysterious superpowers. This was married to an uplifting vision of a future of gender and racial equality, an absence of avarice, and a military with a primary mission of exploration and peacekeeping. The central governance structure, the Federation, was an interstellar United Nations. Member planets made collaborative decisions, were accorded absolute equality, and pooled their resources in pursuit of collective security and cultural exchange rather than plundering conquest. Later movie versions continued this idea-driven focus, dealing with weapons of mass destruction, the strange human lust for damaging our habitat, religious fanaticism, and the end of the cold war. Although these new Star Trek movies – this is the second in the series directed by JJ Abrams – have altered the ratio of ideas to action in favor of the latter, there is a lot to think about in Into Darkness. I will not seek primarily to evaluate the merits of the film – with apologies to Leonard McCoy, I am a doctor, not a movie critic – but instead focus on political themes that deserve our attention. Those yet to see the movie and who wish to do so without knowing plot points will want to postpone reading any further. The movie opens with a sequence exploring the most politically relevant idea in the Star Trek universe: the Prime Directive. This sacred covenant of the Federation – it is Star Fleet General Order # 1 – prohibits interference in the internal affairs of less advanced civilizations. The Prime Directive engages classic political issues of imperialism, colonialism, and development. It is a deeply idealistic principle – self-determination of peoples regardless of their material capacity – that is often compromised in Star Trek and in our own world. Foreign policy realists have constantly cautioned idealists that universal principles, divorced from concrete situations, are likely to be untenable and may do more harm than good. In Into Darkness, the crew faces a choice between allowing a devastating natural catastrophe that will result in the death of the native inhabitants of a planet, or preventing it by making the pre-industrial population aware of technology that can only appear God-like, thus upending their culture and changing the trajectory of their development. These dilemmas remain profound as we think about, for example, the competing imperatives of a responsibility to protect versus intervention aversion in the Syrian civil war. The central plot thread of Into Darkness is suffused with post-9/11 significance. “John Harrison” launches a terrorist campaign upon the Federation, culminating in his flying an aircraft into skyscrapers in the capital city. In the hunt for the terrorist, we learn that he is hiding in a sparsely populated province of a planet where it is politically sensitive for the Federation to conduct military operations. Kirk is ordered to launch a pre-emptive strike on the terrorist camp using unmanned drones. Later, in a speech, Kirk reflects upon the danger, or from another viewpoint the necessity, of becoming evil in order to defeat evil, a debate that has been part of post-9/11 American life. The terrorism plot is conjoined with a classic cold war era rogue military storyline. A high-ranking commander of the Curtis LeMay school of thought decides that war with a hostile civilization is inevitable and resolves to hasten the onset by getting in the first blow. Kirk here plays a role similar to that of President John F. Kennedy, advised by his military commanders to turn the Cuban Missile Crisis into an opportunity by striking the Soviet Union first. 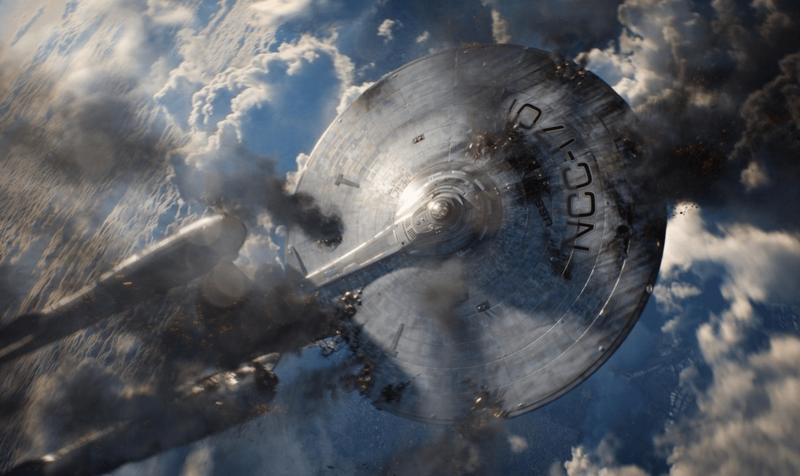 Star Trek Into Darkness resonates with interesting ideas, although Trek purists may feel that its best moments come from a slightly parasitic relationship with an earlier, more emotionally engaging entry in the series. For a summer action movie, it is unusually rich political fare and continues the proud recent run of issue-driven science fiction. John Sides is an associate professor of political science at George Washington University.